Home DEA Look out for that train. Agents Eduardo Rojas Jr. and Hector Clark were trying to cut off the smugglers as they moved north. The agents’ SUV was struck at a railroad crossing in a rural farming area near the town of Gila Bend, about 85 miles southwest of Phoenix. The Border Patrol arrested eight illegal immigrants in the area. The westbound Union Pacific train with 75 cars was moving at about 62 mph when it hit the SUV, pushing the vehicle a half-mile to a mile down the tracks. The distance the SUV was pushed indicates it was moving as slow as 3 mph when the collision occurred, said Detective Aaron Douglas, a spokesman for the Maricopa County sheriff’s office, which is investigating the deaths. Douglas said he wouldn’t speculate on whether the vehicle’s low speed was indicative of a stall. But he said investigators will examine the wreckage of the SUV to see if there were mechanical problems. The SUV was unmarked but equipped with police lights. Before the collision, the train conductor and engineer spotted the vehicle driving on an access road alongside the tracks. They sounded a horn a quarter-mile before the crossing. Union Pacific said its crew had no warning that the SUV would turn in front of the train. The privately owned railroad crossing where the wreck occurred is marked but doesn’t have railroad crossing arms or warning lights. There have been six previous accidents at the crossing dating back to 1984, but only one involved a fatality. 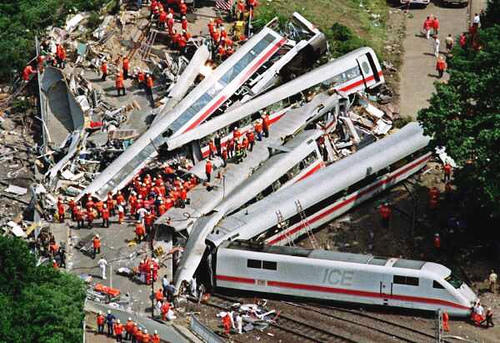 One person died in July 2003 when a semi-truck driver failed to make a complete stop and was struck by a train. Previous articleWatch out for working cops….and off duty cops…..
Something is definitely missing here. I doubt they would have hung around if they were coherent. Trump Bodies Sessions; Wild Antics at The WH!